Birds Bite! It is a fact that if you share your life with a bird, it is more than likely going to bite you at some point and time. Does this mean that all birds are mean or aggressive….Hardly! In fact it is probably furthest from the truth. Birds use their beaks for a variety of reasons. A beak is another hand to a bird and so they use it for eating, climbing, playing etc. Sometimes they aren’t biting at all but just using their beak to step up on you, or check you out. You also have to learn body language and be able to understand what your bird is trying to communicate with you. If he or she is telling you “NO” and you are not paying attention, then a bite may happen. Normally a bird will only truly bite out of fear. There are some birds that have learned to bite due to not being listened to from previous humans in their lives and now they will bite first and discuss later. What you have to keep in mind is that you need to earn this birds trust. This takes time, patience and lots of love. A lot of people have the false notion that if they have a baby bird it will bond to them and never bite. This also is a myth and totally wrong. As a bird matures so do their wants, desires and personalities. Also you have to keep in mind that when a bird reaches maturity their hormones come into play. I have talked with literally hundreds of people who had a sweet loving baby for years and all of a sudden it started biting them. Not to worry though this can be worked through as well, if you are willing to put in the time and effort to forge that bond and relationship. Aggression in parrots include territoriality, hormones, stress, not enough mental stimulation, health issues etc. You need to look at your birds health first off and make sure that they are in good health by getting a full checkup from an Avian Vet. Once your bird has a clean bill of health then you need to look at the environment. Maybe they are fearful of something in the home, or too near a window and seeing too much activity outside. Maybe you have changed something in your home or on yourself. New furniture, moved things around, colored your hair or even wearing a new nail polish. Someone new moved in or maybe even your work schedules have changed.Birds can also associate certain colors with good or bad feelings. You also need to make sure that their diet is a healthy one full of all the nutrition they need. All of these things can factor into your birds behavior and so much more! Parrot bites can be painful and severe. Over the years, I have seen and heard some horror stories involving people and parrot bites. Parrot beaks can be very powerful, even some of the smaller species. Some bites occurred from not aggressive birds but very sweet tame ones in the blink of an eye. If you have children in your home or around your birds…no matter how sweet the birds are you have to be ever vigilant in making sure that both the parrot and the child are safe. A serious bite can happen in the matter of seconds and with a small child this can mean the loss of a finger or an eye. 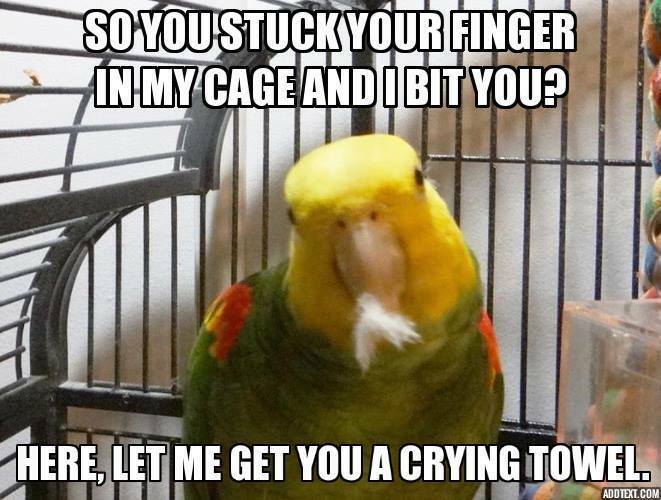 No matter how sweet you think your bird is and has never bitten anyone….it can and does happen! I am not trying to scare anyone from sharing your life with a parrot. To the contrary, I have many and love them so much. However I feel it is very important for anyone considering a bird to gain all the knowledge you can first. These are highly intelligent beings and it is very important for everyone to understand them before you bring them into your home. Birds are given up to rescues, banished to basements, put outside and even let go when the human does not understand them enough to work through the problems. Once given the proper understanding and patience a bird is an amazing companion, but we must study, research and know the facts prior to bringing one into our home. These are wild creatures even the ones bred in captivity are only a few generations away from their natural wild ancestors. The average parrot can go through many homes during their lifetime due to the humans not fully understanding them. They are creatures of very complex emotions and behaviors. They are not meant to be in homes who aren’t fully on board and dedicated to making their lives as rich as possible. Moving from home to home also takes a toll on their emotions. Birds are hardwired to stay in one family (flock) and when given up they can become confused, mistrustful and possibly the start of aggression. However if you are willing to take the time, an adopted bird can be the most amazing rewarding experience of your life. All of my babies came from previous homes. Some had many and some only a few. However I have the most loving birds. They are amazing and I do fully trust them. I have had both babies and adult birds during my life, and I can honestly say that it took time and effort for any age bird to form a bond and a trust between us. Taking home a sweet baby bird can be the most misleading start of a relationship. You think this wonderful little ball of fluff is so sweet…..and then maturity happens and you have no clue what happened to your precious little feather baby. Trust me, unless you are fully aware of all the challenges ahead and ready to devote your lives to these babies….they will change once they mature. And then you must start over on the trust and bonding process. Below is just a small example of pics taken of bird bites and they were from some very experienced bird handlers. Andy – Male Moluccan back bite – Feb 08 – Never turn your back on a nervous Cockatoo! Annabelle – Female Umbrella – 10-17-07 Was on shoulder and got too excited. Annabelle – Female Umbrella – top shoulder – got over excited lashed out. Catalina macaw decided I wasn’t paying enough attention to him. Greenwing macaw bite….I was trying to separate two birds that were bonded. Scarlett macaw got fired up because I was using the phone. It would have been worse, but I had on a denim jacket. Shamrock macaw; did not want to step off of arm. This bite came from a frightened Amazon. Tori – Male Moluccan – 1-15-11 He was a little pissy this as you can see. I should have taken pictures of all the blood, but your first reaction is GET TO COLD WATER QUICK!!!! Tori – Male Moluccan – Nov 2012 – Reached out for step up, he had other plans. Tori – Male Moluccan 11-4-07. Just because he can. I have learned his body language much better now, but those first few years were rough. YCM Sundance got spooked and flew to the floor. Guess he was still spooked because when I had him step up, he got me.